Gorgeous sea views, a prime spot beside the beach, 120 m2 of living space + 20m2 covered terrace in an exclusive residence are the standout features of this stylish and luxury three-bedroom apartment in Calpe. Located in "La Joya" Residence, as well as being next to the sea with direct access to the beach, you can reach almost everywhere by foot. Local bars, restaurants and shops are all within walking distance, while Calpe town centre is just a 5-minute stroll away. A quiet setting with few neighbours and no distractions means this intimate residence is also perfect for anyone seeking true relaxation. All summed it, there's everything here for an unforgettable Spanish holiday whatever time of year you visit. Fully equipped for long or short term stays, this tastefully furnished apartment offers plenty of space to relax at leisure. Share meals and drinks on a covered terrace, relax in a large living area, cook up meals in a well-equipped kitchen and fall asleep to the sound of the waves in one of three comfortable double bedrooms. A range of contemporary amenities will also make you feel instantly at home with Wi-Fi, air conditioning in every room, satellite TV (with all UK channels) and private parking all included. The Inside Space: Soak up views of the glittering Mediterranean from the comfort of your covered terrace, looking directly across the beach. A garden dining set and chairs make this a fabulous spot for enjoying breakfast and planning a day of coastal adventures. Whip up meals in a clean and contemporary kitchen with all-white cabinets and integrated appliances including an oven, hob, microwave, dishwasher and refrigerator. When it’s time to tuck in, pour drinks and serve up freshly prepared dishes at a dining table that seats six. The dining area opens out to a spacious living room with soft sofas, a flat-screen TV and cable. On leisurely days, it’s the perfect place to watch movies or relax with a good book. The apartment also comes with two bathrooms (one of which is an en-suite) and three large double bedrooms, each furnished with comfortable beds and a classic Mediterranean vibe. The master bedroom also comes with access to a small covered terrace. The Surrounding Area: Spend days digging your toes into soft sand, swimming in turquoise waters or topping up your tan from the comfort of a sunlounger. With the beach situated just seconds away, this languid sun and sea lifestyle is yours to enjoy for as long as you stay. Local restaurants are also just a short stroll from your front door, and you’re only a 5-minute walk from Calpe town center - home to cafes, restaurants, a fantastic shopping district and an historic old town with ancient Roman and Moorish ruins. A place under the sun! This was the most wonderful stay we've had in Spain so far! The apartment is absolutely wonderful, finished to a high standard and well equipped. You are practically out the front door and onto the beach with bars and restaurants all around you. Communication with the property manager was perfect. We really were not lacking for anything this entire stay. Calpe is such a beautiful town, not overrun with tourist which makes for a nice relaxing holiday. It felt like our second home and we cannot wait to return for our 3rd time next year! We stayed over winter and loved every minute of it. 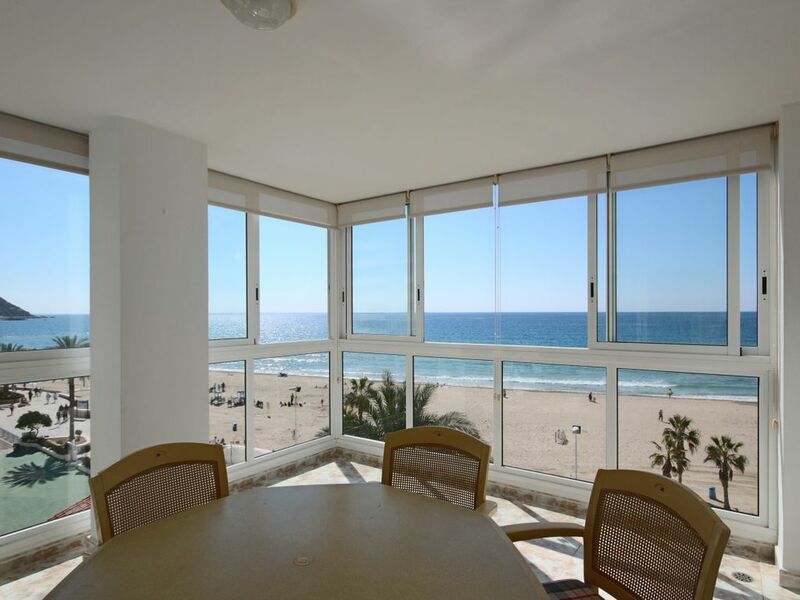 Very close to all amenities and could not get any closer to the beach. Trés bel appartement, bien équipé, très agréable, terrasse panoramique, vue magnifique sur la baie de Calpe et son rocher. Trés bien reçu par les propriétaires, qui sont charmants. Une fois installé vous n'avez plus envie de repartir, je reviendrai. El edificio y el piso era tal y como esta en la descripción del anuncio.Hemos de manifestar que el trato recibido por el propietario ha sido excelente en todos los sentidos una persona muy educada y que nos soluciono todo lo que le pedimos. Con ganas de volver el próximo año.